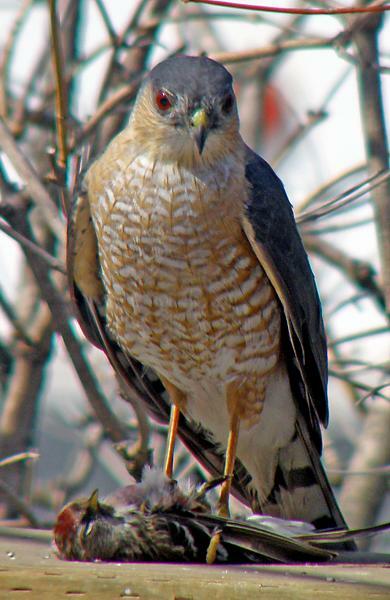 The population of Sharp-shinned Hawks appears to be increasing significantly, according to a recent analysis of Christmas Bird Count records conducted by National Audubon Society scientists. It is possible that the North American population has increased by as much as 225% in the last 40 years. There is sufficient data about this species to have a fairly high level of confidence in this magnitude of growth. January 15, 1998. Observed by Bruce Murphy outside of Cobalt. It was dining on Common Redpolls. April 10, 2009. One observed by Lionel Venne and Michael Werner in Elk Lake. April 15, 2009. One observed and photographed dining on Redpoll in Englehart by Serge Gendron.